Reviews of Science Fiction and Fantasy novels by a finicky physicist. “For eons, sandstorms have swept the barren desolate landscape of the red planet. For centuries, Mars has beckoned to mankind to come and conquer its hostile climate. Now, in the year 2026, a group of one hundred colonists is about to fulfill that destiny. I’ve been meaning to read the Mars Trilogy for quite a while, ever since I enjoyed Robinson’s Years of Rice and Salt years ago. Given the length of the trilogy, and the overpowering density of detail I expected from Robinson’s work, I somehow just kept putting it off. Now, I’m finally doing it, and Red Mars is a wonderful first installment of the series. I would personally say that it stands alone as a novel, but I have heard other opinions. It certainly leads into the second novel, sort of like how the 20th century led right into the 21st. I would say that, above all else, Red Mars is a hard SF novel. The focus of Red Mars is the process of colonization and the formation of a Martian society. I’m sure a tremendous amount of research went into extrapolating how current technology could advance in such a way as to make the colonization possible. Robinson is incredibly thorough, and he meticulously details everything, from the construction of the habitats, to the many different efforts towards terraforming, and so on. I particularly enjoyed the terraforming discussions. Robinson describes all the different ideas the scientists on Mars have for increasing the surface temperature, thickening the atmosphere, and increasing the oxygen content of the air. Not everything is a success, and some of the plans backfire in interesting ways. Robinson shows us the effects of the settlement and the terraforming on Mars through lengthy descriptions of the planet’s countryside and geography. Whether or not all of the technology he describes could be real one day, almost all of it seems completely plausible. Beyond the physical effort of colonization, he also spends an immense amount of time detailing the sociological, political, and economical forces shaping the colonization. The colonization begins with the First Hundred, carefully selected specialists that are sent to establish the first dwellings on the Martian surface. Even among the First Hundred, there are many conflicting ideas of how Martian society should be shaped, what their relationship should be to the Earth, and to what extent Mars should be terraformed. The situation becomes immensely further complicated when their past catches up with them in the form of governmental controls, transnational corporations with their eyes on profit, and desperate, culturally diverse immigrants from the crowded Earth. The narrative is from the point of view of people from the First Hundred, and it shifts with each major segment of the book. I enjoyed that, even though it was in third person, the narration felt distinctive for each character. While none of the characters seemed universally sympathetic, they were all well-rounded and had interesting ways of seeing the world. My personal favorite segment was that of the homesick French psychologist Michel Duval. However, even while we’re following hard-working, cynical Frank’s bitterness, idealistic, Mars-loving Ann’s despair, or the drama queen Maya’s love triangle, the focus is always on Mars. They are all just the human windows through which we are allowed to see the development of Martian history. 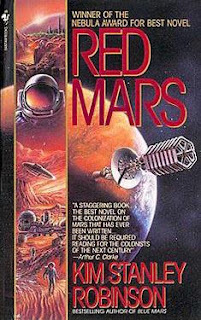 Though I was very entertained by Red Mars, I have to admit that, in my opinion, it was not a completely flawless book. It’s very slowly paced, and the human stories were often overshadowed by the huge amount of scientific, geographic, social, and political information that ran through the narrative. Furthermore, some of Robinson’s guesses for the future were a little off, so the novel sometimes feels a little dated. For instance, Robinson’s colonization of Mars is headed by the US and Russia in the 2020s. I’m not sure who could head that kind of a multi-billion dollar project given today’s economy, but I doubt it would be US/Russian. Also, his Earth is collapsing under a Malthusian population crisis, something that doesn’t really appear to be hanging over us at the moment (or maybe I just don’t see the signs!). One other element that bothered me was his most fanciful technological development—an immortality treatment. I think he included it so that we could follow the same characters through a large swathe of Martian history, and so that Earth’s population problems would more quickly come to the breaking point. However, compared to how much detail he lavished on the other technology of the novel, the DNA-repairing, anti-aging treatment seemed almost like a simple plot device. Despite all of this, I think I can solidly recommend this novel to anyone who is interested in reading an in-depth description of Martian colonization. Red Mars is an immersive, thorough, near-future account of the colonization of Mars and the subsequent development of Martian society. It is terrific hard SF, with plenty of ecology, geography, physics, sociology, politics, engineering, and economics to keep your mind engaged. It also features well-developed, if not completely likable, characters through which the reader watches the future unfold. Though it is thick with information and slow-paced, it is a fascinating vision of the sort of future we could still be moving towards. Red Mars is one of my favorite hard SF books. I think KSR must have had a giant Mars atlas on his desk that he would pore over between paragraphs as he wrote. Such detail seemed borderline obsessive... and I ate it all up. I remember wishing I had that atlas too so I could follow along. A very slow read as I remember with all the politics etc. but I really loved the material science/technology advancements that he lavished on us every other chapter. So many wonders in a single book! You're right about his timing. He should have moved the story forward a hundred years. I can imagine that, KSR carefully marking each settlement as it is founded and each major change in geography. I love his attention to detail. It makes everything seem so real, almost like it could truly happen someday! I loved this book. Believable, not only scientifically, but also the political undertows. It was a slow read, but it never felt a drag, mainly because I got deeply emerged, like what I imagine ardent readers of fantasy series can become. I actually had an "atlas" from an old, locally published astronomy book. It certainly helped in making the story more real. Sadly, I never got onto Blue and Green Mars, but they do lay in wait. That sounds like fun! I thought about using the model of Mars from Google Earth to follow along, but I didn't get around to it. I'm planning to read Blue and Green Mars in the next few months, though I'm wondering if they'll be able to live up to the first. I'm putting up the "Hominids" review later today. Now I'm curious to see if we had similar complaints :). Wow, that much have been a really long audiobook! I listen to audiobooks sometimes when I commute, but my brain seems to be naturally wired to absorb visual information, not auditory. Did they do a lot for the voices/accents of the different characters? I've been meaning to read Green/Blue Mars for a while now, but I keeping putting them off. I definitely want to read them, it's just such a time commitment!